Over the last two years we have been following the renaissance of this charming old farmbuilding which has been restored with a great sense of easy living. The owner, an Italian who has lived in Brasil and works with India, has had a light hand in mixing and matching furniture, textiles and objects from 3 continents. 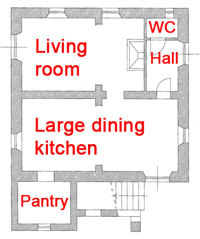 Two large spaces occupy the ground floor. The kitchen runs along the entire width of the house, has windows or doors on 3 sides and organises itself around a large typically Tuscan farm table. The antique tiles behind the sink were discovered at the Arezzo flea market, the lamps above the table were brought back from India. French windows open onto the garden. The living room has a large fire place, french windows, white sofas and chairs and a colourful Indian dhurrie. The style is simple and comfortable, just as we like it. The upper floor is reached over the outdoor stairs which lead into a sunny upstairs living room and two bedrooms, each with its own bathroom. The view from the bedrooms is lovely: rolling hills and the charming town of Lucignano on the horizon. 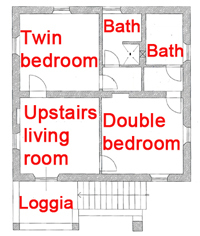 The annex, about 20 metres from the main building, houses another double bedroom with bathroom and private terrace. the material used here was made to order in India, to the design of the owner. At the back of the annex you will find a large laundry. The pool lies on a lower level of the garden down a gentle slope. The grey stone and dark turquoise colour of the water give this pool a very stylish look. There is a shower next to the pool. The town of Lucignano lies 3 km (1,8 miles) from the house. Rocchetto can be rented with 2 or 3 bedrooms. 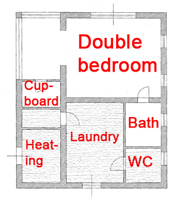 If you rent the house with 2 bedrooms, the annex will be closed (and not rented to anyone else). The small and charming estate Le Rocchette lies halfway between Arezzo and Siena, close to the hilltop village of Lucignano, known for its streets built in circles around the main church. Giorgio and Roberta della Seta, who are also the owners of the wine estate Tenuta di Gracciano on our website, acquired Le Rocchette 3 years ago. The location of the house as well as its compact size and shape seduced them instantly. Most of Tuscany’s major sight-seeing spots can be reached in approx. 1 hour’s drive. Think Florence and Siena, but also Arezzo, Pienza, Montalcino, and Montepulciano. And should this not be enough, cross the border to Umbria and discover Perugia, Città di Castello, Orvieto and Assisi, all in about 1 hour by car. The nearest village is the medieval hilltop Lucignano, famous for its eliptic walls. Here you will find grocery stores, cafés, newsstands, banks and simple trattorias. A detailed list of restaurants recommended in the vicinity can be found in the farmhouse. But you will not want to miss the surrounding villages such as Monte San Savino, Foiano, Sinalunga and Castiglion Fiorentino as well as the medieval hamlet of Gargonza, all of which will conform in their picturesque perfection to everyone’s dream of a hilltop Tuscan village. Arezzo is the next largish town. You will not want to miss the frescoes by Piero della Francesca in the Basilica San Francesco. If you are at Le Rocchette on the first week-end of the month, you might also want to visit the antique market on the main square. Florence and Siena, Tuscany’s most important cultural milestones, are easy to reach from Le Rocchette. Two excellent SPAs can be found in the Rapolano Terme thermal resort (18 km from Le Rocchette). Bravo, vraiment tout y était, Beauté, Propreté, tout est prévu. Donella est charmante et serviable. Calme, confortable, piscine grandiose. Seul petit point pour moi, moins réussi c'est le barbecue qui n'est pas très professionnel et que nous n'avons donc pas utilisé, mais ce n'était pas du tout indispensable. Vous nous reverrez certainement, là où ailleurs, et je tiens vos coordonnées bien précieusement. Encore toute nos félicitations. The house was better than expected. It is very well equipped, everything one needs in the kitchen, very thoughtful supplies in bathrooms, first aid kits, all very well thought out and in pristine condition. The garden and pool are very well maintained, the views are lovely, and the local shops are easily reached (for those who like a good walk the main gate of Lucignano is exactly two miles from the house and it is a very pretty road). The staff where all very friendly and helpful, everything was well explained, the cleaning was exemplary and the gardener discreet. All much better than we had expected, thank you. Further to your letter requesting feedback on our recent stay at Il Rocchetto, I would like to thank you for giving us the opportunity to stay in such an idyllic spot. The location was perfect, close enough to the local town of Lucignano to stock up on delicious meat and wine, but far enough away that we had total privacy and quiet. The house was well suited to our needs and both the caretaker Chiara and housekeeper Donella were charming and helpful. Our favourite thing about the house apart from the isolation, were the large grounds which were ideal for tiring out an enthusiastic and energetic puppy, and the heavenly pool that offered shade and sanctuary during a very hot first week. I am writing to let you know how much we enjoyed our stay at Rocchetto. It is a spectacular place and was even more beautiful than the photos led us to believe. We were delayed at the airport, but Chiara and Donella (the housekeeper) were patiently waiting for us when we finally arrived. They did a wonderful job showing us around and explaining how things worked (washing machine, alarm system, gate, etc.). The house was wonderful, very comfortable and incredibly clean. The bathrooms were modern and the house had everything we needed. We especially appreciated all the information about restaurants and local markets at nearby villages. The grounds were extremely well maintained and the pool was in excellent condition. We found it to be the perfect location! Our family of four (two teenagers) walked into town many evenings to enjoy dinner at the local restaurants. We also made a day trip to Florence and another to Siena. It was hard to leave Rocchetto, however, because it's such a peaceful, relaxing place with spectacular views. Donella was tremendous! I cannot believe what an amazing job she does - the sheets are perfectly pressed, the house immaculate. She is truly a wonder! Der Aufenthalt im Haus Rocchetto hat uns sehr gut gefallen, ein Ferienhaus in traumhafter Lage und ausgestattet mit allem was man sich nur wünschen kann. Die Häuser waren, wie beschrieben liebevoll und geschmackvoll möbliert, der Service vor Ort zuvorkommend. (Einmal war morgens das Wasser versiegt, nach dem Frühstück war das Problem schon behoben. Als die Nächte etwas kühl wurden, kam ein Anruf, ob wir wärmere Decken bräuchten). Wir können die Ferienhäuser wärmstens weiter empfehlen! Thanks so much to you and your company for being so professional and helpful every step of the way. Our stay at the villa was very enjoyable and we command you for picking such a beautiful place with such beautiful surroundings. It was peaceful and comfortable for all 6 of us to enjoy inside and outside. Aside from the first couple of nights before the heat was fixed and the issue with the glass pane, we had no issues with the house. Great location and a good pick to have as a listing. It was a true Tuscan experience. Le Rocchette lies 30 km south of Arezzo. The closest village with shopping facilities 3 km from the estate is Lucignano, a typically Tuscan hilltop village famous for its streets arranged in a circle.